alaTest ha recogido y analizado 39 comentarios relacionados al producto Epson SureColor P800. En promedio, la calificación para este producto es 4.0/5, al ser comparado con la calificación 4.0/5 de otros productos en la categoria productos. La gente está impresionada con el diseño y el tamaño. El funcionamiento y la calidad de impresión también consigue un buen feedback pero muchos son menos favorables respecto a la fiabilidad y la calidad del montaje. Analizamos las valoraciones de los usuarios y los expertos, la edad del producto y demás factores. 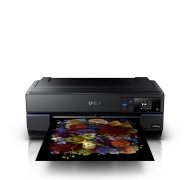 Comparado con otros productos el Epson SureColor P800 recibe una alaScore™ global de 95/100 = calidad excelente. The Epson SureColor P800, which can print to a wide variety of paper sizes (including rolls with an optional adapter), is an excellent photo printer for pros and hobbyists alike. Excellent print quality. Relatively light and compact. Can print on many different types and sizes of paper. Multiple high-quality ink tanks produce deeper blacks and saturated colors. Paper roll add-on comes without a cutter. Wastes some ink when switching between matte black and glossy papers and back again. Pros: Vibrant color reproduction; Deep, rich blacks; Roll paper & panoramic printing support; Front-loading fine art media system better than rear-feed method of predecessor. A replacement for the venerable Stylus Pro 3880, the P800 packs improved inks, a touch screen, a better manual feeder, and the option for roll paper. Deep-pocketed photo pros: Commence slobber. When we reviewed Epson's SureColor P600 with NJ photographer David Patiño, he told us that he wished it was bigger. Store bilder er mye kulere å se på, da trenger man skikkelig verktøy. Epsons skrivare ger helt oöverträffade fotoutskrifter ända upp till A2-storlek, men priset är också därefter. Epsonin tulostin on valokuvatulostimien vastaus ökyautoille. Epson tuottaa ylivoimaisen laadukkaat valokuvatulosteet jopa A2-koossa, mutta hintakin on sitten sen mukainen. Stora bilder är mycket roligare att titta på. Men man behöver ett ordentligt redskap. Felfria fotoutskrifter i storformat gör att bilderna kommer till sin rätt. Trådlös utskrift och flexibel pappershantering gör skrivaren lättskött, även för oerfarna fotografer.